MOSCOW -- If Luzhniki Stadium were, say, Staples Center, you'd be tempted to say that the crowd that "filled" the seats for the third full day of the 2013 track and field championships was like something you'd see at a mid-season women's basketball WNBA game featuring the Los Angeles Sparks against, say, the Tulsa Shock. That underwhelming. It was so disconcerting, in fact, that one American business executive sent a text message Monday evening to a reporter friend saying he had a section of the stadium all to himself. This on a cool, beautiful night when Olympic champion Shelly-Ann Fraser-Pryce of Jamaica rocked the women's 100 meter finals in 10.71 seconds, winning by an almost unheard-of 22-hundredths of a second; American David Oliver made himself the comeback king in the 110-meter high hurdles in 13-flat; New Zealand's Valerie Adams proved herself, yet again, unstoppable in the women's shot put with a winning throw of 20.88 meters, or 68 feet, 6 inches; and more. It's embarrassing, no two ways about it, and whether the blame is to be apportioned to the city of Moscow, the Russian government, the IAAF, the fact that it's summer and the Russians are quite naturally at their dachas and someone should have known that when they were planning a world championships for August -- whatever, it absolutely does not reflect well on what is supposed to be the No. 1 sport of the entire Olympic movement. If it's this way here, in Moscow, it makes you wonder: what are the attendance figures bound to be in six months in Sochi, down in southwest Russia, for the 2014 Winter Games? To be super-obvious: Moscow is one of the world's great capitals. Sochi is not. You can get to Luzhniki on the Moscow metro, one of the world's best. You get to Sochi, down in southwest Russia, on the Black Sea, by significant planning. The Sochi airport is not big. Only so many planes can land there in so many days. These championships mark the beginning of Russia's so-called decade of sport. The 2014 Games will be followed by the 2015 swimming championships in Kazan and then, in 2018, soccer's World Cup. Figures for Monday evening were not immediately available. -- The numbers are based on ticket scans at stadium gates. Someone who goes in and out multiple times counts only once. -- Luzhniki is ordinarily an 81,000-seat stadium. 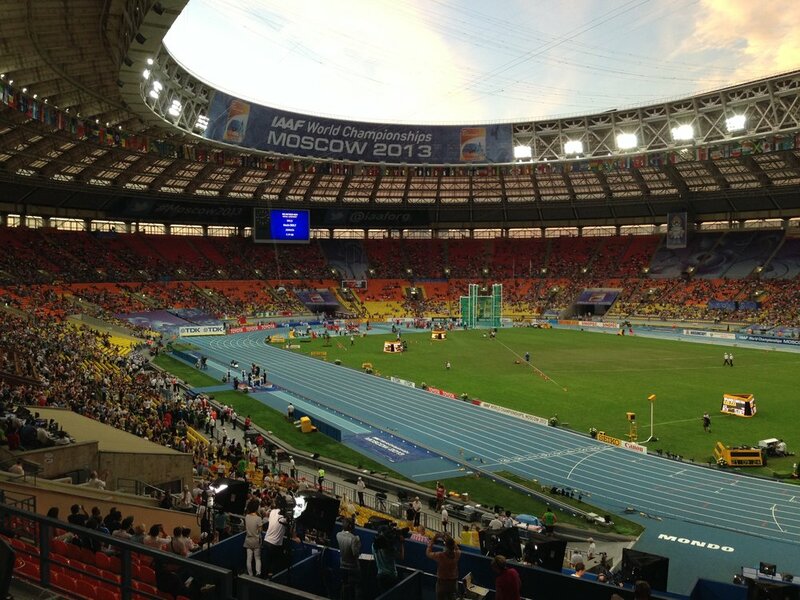 As it has done in prior championships, the IAAF has blocked out blocks of seats to lower capacity. On Saturday and Sunday, capacity was 59,000 -- 43,000 spectators and 16 "accredited guests," meaning VIPS, media, athletes and others. On Monday, capacity was lowered further still, to 50,000 -- 34,000 spectators and 16,000 "accredited guests." "It's dead. There's no atmosphere," Olympic champion Felix Sanchez told reporters after winning his 400-meter hurdles heat Monday morning. "It's like day and night compared to London last year," he said, referring to the 2012 Summer Games. As the attendance figures underscore, the contrast is especially marked in the morning heats. In London, even the morning sessions were jammed. Here -- there are pockets of fans, in particular Ukrainians, noticeable in their blue and yellow, in the yellow, orange and red seats. Mostly, though, there are reporters and camera crews. Some are complete track junkies and love every single tidbit. Others are here on the off chance something unusual happens. David Johnson, who runs the Penn Relays each spring and is here as a correspondent for Track & Field News, has been to every IAAF world championship since the first edition in Helsinki in 1983. He said of Moscow, "It feels like the smallest attendance, based on the men's 100 meters, in my experience." That race, Sunday night, saw the stadium filled to roughly two-thirds capacity even though the biggest star in Olympic sports, Usain Bolt, was in the house. Bolt ran 9.77 to win; lightning struck at precisely the moment he crossed the finish line, creating not just one of track and field's but indeed all of sport's most iconic photographs in not just this but any year. Luzhniki features an overhanging roof that circles the stadium. "Despite the size of the crowd," Johnson said, "the architecture of the stadium produces a noise beyond the crowd. It's the visual effect that's lacking." That same overhanging roof, however, makes the scene -- particularly in the mornings -- even more eerie. The public-address system announcements ricochet, unintelligibly, around the empty seats. Ticket prices started as low as 100 rubles, roughly $3. Even for Sunday night. That's right -- you could have seen Bolt run Sunday night for 3 bucks. Name a better deal in all of sports. And yet -- the place could only manage two-thirds capacity? Organizers allege that next weekend, which includes the four relay finals, is sold out. They also said before the event began that they had sold more than 80 percent of the ticket inventory. "It was hot and very sunny and I know for Muscovites -- they always go to their dachas, they go outside, and maybe someone has bought a ticket and they don't attend. "We insisted very seriously and very strongly regarding a promotion campaign and a lot of money was invested." Journalist Elliott Denman has also been to every edition of the IAAF championships. A member of the U.S. Olympic track and field team at the Melbourne Games in 1956, he then turned to sportswriting and has been at the business -- one of the best -- for more than 50 years. He called attendance here at Moscow "sparse." "Like everywhere," he surmised, "people have other opportunities."